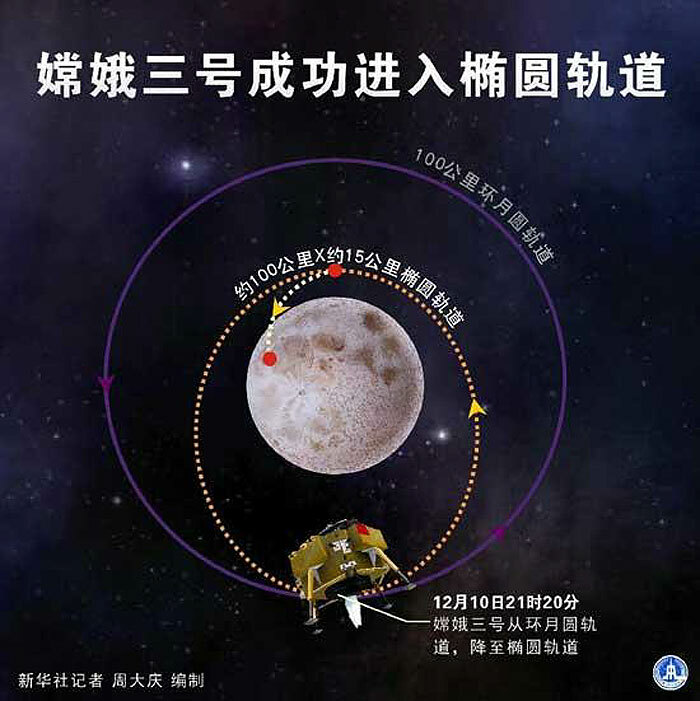 China's maiden moon landing probe, Chang'e 3, is scheduled to make a powered descent to the moon's surface in mid-December, firing the landing thrusters at an altitude of 15 kilometers in a pre-selected area in the moon called the Bay of Rainbows. 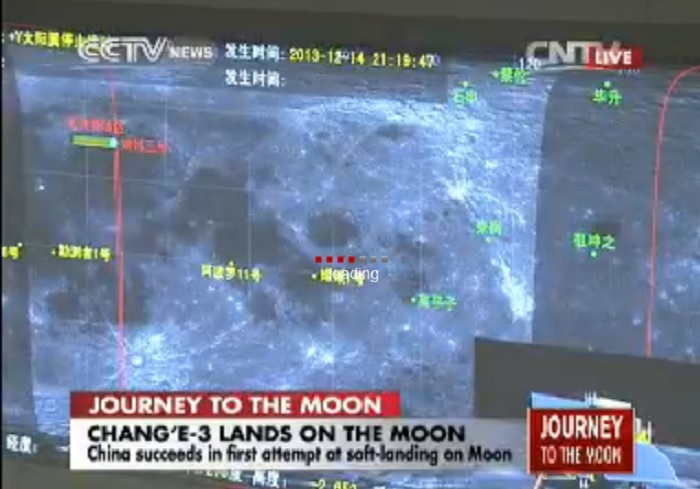 This will mark China's first soft landing on the moon, and the first by any country since the 1970s. Among all those who have watched closely the probe's historic journey from the earth to the moon is Ouyang Ziyuan, a Chinese cosmo-chemist, geochemist and space-exploration advocate. As former chief scientist of the Chinese Lunar Exploration Program, Ouyang Ziyuan is the most prominent supporter of the Chinese-manned lunar exploration program, and also lobbies for the Chinese exploration of Mars. On today's show, we will get up close and personal with this top Chinese scientist and lunar enthusiast; we will, hopefully, learn a bit more about earth's nearest neighbor, the familiar, yet still mysterious, moon. Stay tuned to this edition of "Life in China" for this fascinating journey into scientific wonder. When watching the Chang'e-3 lunar probe blasted off on board an enhanced Long March-3B carrier rocket from the Xichang satellite launch centre on December 2rd, Ouyang Ziyuan says his heart was filled with pride and excitement. As a senior advisor to China's lunar exploration program, Ouyang says he feels he's somehow destined to discover more about the moon. 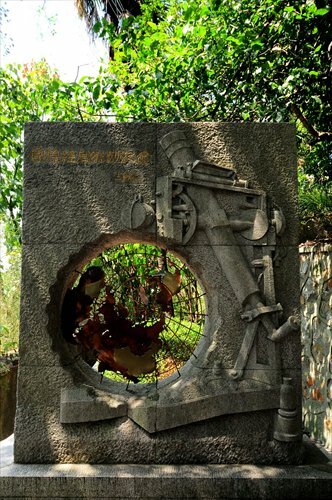 Though his name contains the character "yuan," which means "far away" in Chinese, Ouyang had initially focused his career on the geological exploration on Earth. A native of Ji'an in Jiangxi Province, Ouyang obtained a degree in geology at the Beijing College of Geology and a doctorate in mineral deposits and geochemistry at the China's Academy of Sciences' Institute of Geology. Thereafter, Ouyang spent many years conducting studies in deep mines. But Ouyang says he has been interested in the moon from a very young age. "I love the moon from the bottom of my heart. Whenever I see a moon hanging up in the night sky, I'm drawn to it; I want to understand more about Earth's nearest neighbor. We Chinese are all familiar with a legend, which tells how Chang'e, a beautiful and kind-hearted lady in ancient China, swallowed a panacea pill, flew to the moon and became an immortal in order to prevent the fabled elixir of life from falling into evil hands. " Ouyang Ziyuan's interest in the moon grew when he read about the catastrophic collisions that are believed to have occurred when meteorites hit the Earth. 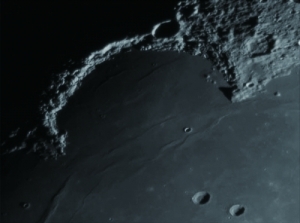 "Unlike other celestial bodies, the moon clearly shows thousands of craters. Observing and carefully studying the craters helps us better understand how we on Earth can escape this sort of disaster. Meanwhile, the moon has been a loyal guard of Earth for billions of years. In my eyes, what is fascinating about the moon is not what it looks like, but its years of noble acts to save our planet." Ouyang Ziyuan believes that what we have explored so far is just a small step in knowing the whole moon. He is deeply attracted to Earth's only natural satellite and curious about its origins, evolution and future. 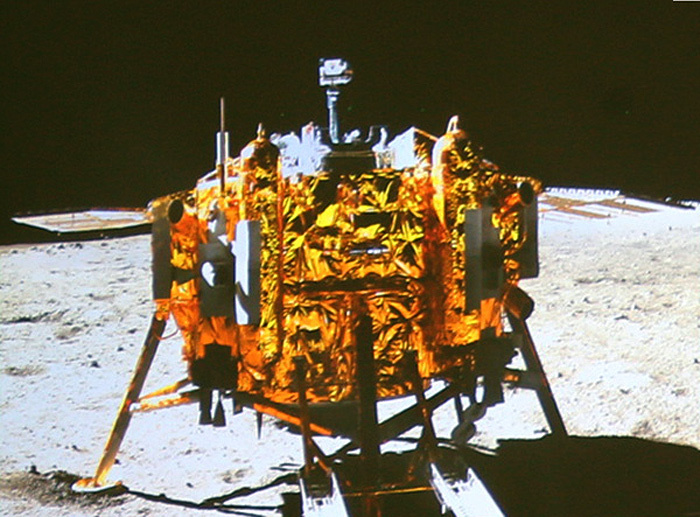 Since the late 1990s, Ouyang has been repeatedly lobbying the government to begin lunar exploration. The dream came true in 2004, when the Chinese Government announced a 1.4-billion-yuan satellite-based lunar exploration program called the Chang'e Project. Ouyang became the first chief scientist for the program. Ouyang Ziyuan believes that, as well as the pure scientific value, moon exploration could bring huge economic returns. For example, everyone knows fossil fuels such as gas and coal will run out one day, but there is at least one million metric tons of helium-3 on the moon. "The moon has huge reserves of metals such as iron. Helium-3, an isotope of the element Helium, is an ideal fuel for nuclear fusion power, the next generation of nuclear power. It is estimated that reserves of Helium-3 across Earth amount to just 15 tons, while 100 tons of Helium-3 will be needed each year if nuclear fusion technology is applied to meet global energy demands. The moon, on the other hand, has reserves estimated at between one and five million tons." Ouyang says he often encounters people asking why we keep doing things that have already been done by others. Those questions and people's lack of scientific knowledge have made Ouyang realize the necessity of spreading popular science knowledge to the general public. Someone once told him that he is like a sincere priest, preaching his ideals. "To give lectures to a wide range of audiences, I have to prepare different presentations appropriate for academicians, government officials, college students and even young students, respectively. I introduce basic information about the moon, China's lunar probe project and how the lunar exploration we do today will have an impact on all of mankind in the future." "The program, which lasted from 1961 to 1972, led to the invention of more than 3,000 kinds of new technology, boosted the country's economy and contributed to its political interests. China's exploration of outer space has so far already promoted technological improvement, innovation and cultivated a great scientific team." According to Ouyang Ziyuan, the launch of lunar probe Chang'e 3 would bring China closer to putting an astronaut on the moon and using Earth's closest neighbor for deep space exploration. Ouyang says the moon is a symbol of beauty in Chinese culture. Plenty of poems have been written about the moon, and the Chang'e orbiters are inspiring more and more Chinese people to dream about flying there. It now takes about four and a half days to fly to the moon and at least eight months to get to Mars. Flying to other planets would require many more years. Ouyang Ziyuan says, with progress in moon exploration, the moon will become a great treasure to sustain the development of mankind. It will be an ideal trans-shipment station for those who want to explore, or one day even migrate, to another planet. "My biggest wish is that we could travel further away. By 'further away,' I mean further than 400,000 kilometers, the distance between Earth and the moon. I hope it will be one billion, even 10 billion kilometers away from our home planet. I hope that China will not only explore the moon and Mars, but the sun, Venus and Jupiter, as well." Intro: You are listening to "Life in China". From the moon to the earth. Twenty-eight-year-old Qin Yuefei completed studies at Yale University in the US in May 2010 with a double-major in politics and economics. However, he gave up opportunities for high-paying jobs in banks and securities firms to go back to China and serve rural people in a Hunan Province mountain village. Next up on today's show, Su Yi introduces us to this down-to-earth young man, who is building up his career from the ground up. Yale graduate Qin Yuefei started working Hunan Province's Hejiashan Village in 2011. He passed a special civil service exam to join ranks with about 210,000 other village officials throughout rural China. The central government expects the number of village officials to swell to 600,000 by 2020, according to its "College Graduate Village Official" plan, launched in 2008, to employ talented urban youth to invigorate rural government leadership. "I hope I can accumulate enough experience in the area of public service from the underserved part of society. I regard my position as a learning experience about healthcare services, relations between villagers and the development of public works, particularly irrigation and drainage." Still a new member in the village, Qin raised a total of 800,000 yuan to fund public services in his first year on the job. Before he came to Hejiashan, villagers complained about a canal in urgent need of repair, delayed by a lack of funds. Qin got in touch with a rural charity foundation in Beijing via the Internet. He convinced the director to provide the village 100,000 yuan to restore the canal. Qin says when studying at Yale, he participated in various activities, including soliciting sponsorship. He says reality is different from theory, and his negotiations with sponsors were not an easy task. Most attempts failed, but he did succeed several times. And that was just the beginning, after which he was determined to bring tangible benefits to the villagers. Since over 60 percent of young farmers from the village work in cities, the very young and the very old are often left behind. But the 38 beds at the village's only nursing home were far from enough. Qin managed to solicit 300,000 yuan from another foundation for the rest home's expansion, which is now ready for use. In addition, Qin raised funds to buy tablet computers for 700 students of four primary and middle schools near Hejiashan. With interactive educational software, students can get remote guidance from volunteer teachers via the Internet. Qin's hard work is paying off. He gets along with villagers, who view him as one of their own. --"He is a man of action. We all trust him! I often tell my kids to learn from him." --"We hope that there are more and more officials like him. We all hope that he can stay here longer." In fact, Qin is a city boy, and his parents are salary workers from Chongqing -- a 1,000-kilometer drive from Hejiashan. After graduating in 2005 from senior high school in his hometown, Qin Yuefei took up the offer to do a bachelor degree at Yale University on full scholarship. Qin says his decision to start his career as a village official also has something to do with seeing his parents sacrifice much for his growth and education. He feels it his obligation to help the disadvantaged change their situation for better. But Qin admits that he did not get off to an easy start back in 2011. When he first arrived, no one wanted to trust the clean-cut, well-dressed young man who had just come back with a flashy Ivy League diploma. To persuade them to accept him, he used the "When in Rome" approach, behaving just as the villagers did. He stopped taking baths twice a day, after villagers began suspecting that Qin washed so frequently because he was afraid to get a little dirty. "I abandoned trendy sneakers, and now generally wear the sturdy, time-honored "liberation" green canvas shoes with soft rubber soles and toecaps. In fact, if my shirt had a gaudy print on it or was a garish color, I would wear it inside out. When a villager offers me a cigarette, I follow the local etiquette of placing it behind one ear. I also squat by the roadside when waiting for a bus, as locals normally do. I have consequently won the villagers' trust and am now considered as part of the community." Local residents have also taken him under their wing. Concerned about his light wardrobe in wintertime, they have given him a military overcoat, and frequently present him with home-cooked dishes. In true country fashion, they also have no scruples about enquiring about his private life. On the other side of the coin, they look to him to carry out domestic repairs. Villagers truly appreciate the help he gives senior residents with everyday tasks like carrying home vegetables and water. They also admire his resourcefulness in finding the right people to deal with problems he cannot solve alone. "I stroll along the street every day, just to let the villagers know I'm here and ready to help." In fact, Qin can hardly make it through town without someone slipping him a handful of eggs, cooking oil or some other token of appreciation. And nowadays, Qin is commonly the go-to for villagers in need of help, whether it be a problem as small as a broken water-heater or a farmer looking for an extra set of hands. Qin says after the villagers began warming up to him, their support made it much easier for Qin to get things done around town. In last year's election of deputies to the Hengshan County People's Congress, he won 85 percent of the electorate votes, becoming China's first county legislator with an overseas education. Honoring his responsibilities since his appointment to the post, Qin has been vocal on a number of issues, ranging from senior villagers' pensions to school bus safety in rural areas. Upon being elected a deputy to the National People's Congress, Qin's first proposal was to run a rural school bus service. ""For years, I saw many young officials who came for short-term rural experience, but I admire him the most. I don't want to see the talented young man stay here forever, though. He should have a brighter future." "I don't think it's appropriate to say I've changed a lot of things here. Actually, life here has shown me a bigger picture, which I can use to solve problems. Every day is a new day; what I got from being here has improved my decision making skills." Though he has had to deal with skeptics accusing him of either wasting his time and talent on a petty job or of being ambitious for his political career, Qin has been able to set it all aside. He believes that working in a rural community provides a platform of open access to the relevant contemporary issues of country life, such as rural education, health care and migrant workers' left-behind children. His ultimate aim is to gain a comprehensive understanding of these matters and see whether or not he is fit for long-term work in public service. "I don't think I'm overqualified for my job. I'm not here to argue. I'm here to get things done and people can see that - that's all the proof they need to know what I'm all about. Empty talk leads nowhere; I just follow my heart and do it." "Beijing, Tianma (a winged horse in Chinese folklore) is operating normally." The voice is cool and controlled. It echoes through the Very Long Baseline Interferometry (VLBI) Center Hall at the Shanghai Astronomical Observatory (SHAO) in the Sheshan Science and Technology Park, about 40 kilometers from the city center. These days, even when most people in Shanghai have gone home, scores of people are still at work here. They concentrate on the many different batches of information displayed on the large screen at the center of the room, watching the real-time operation of the Chang'e-3 lunar probe. 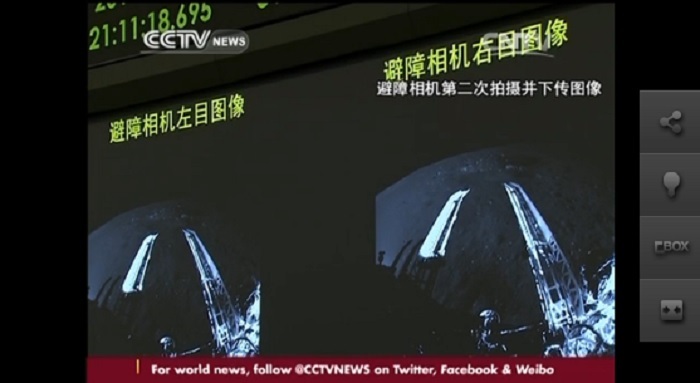 Live images produced from radio telescopes are being shown on a smaller screen on the left and voices from the Beijing Aerospace Control Center broadcast intermittently from loudspeakers. At 1:30 am on December 2, Long March 3B rocket blasted off from the Xichang Satellite Launch Center, carrying the Chang'e-3 on a lunar voyage that some Chinese have been dreaming of for thousands of years. 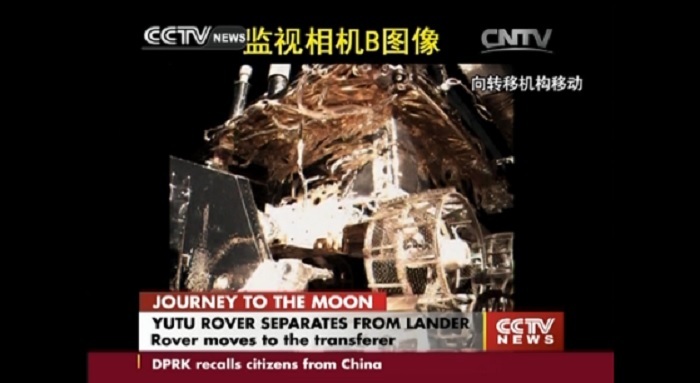 The Chang'e-3 lunar probe comprises a lander and a rover named "Yutu" (Jade Rabbit), after the pet of the moon goddess Chang'e who, in Chinese folklore, flew to the moon with her and has lived there ever since. On Saturday December 14, after a 12-day journey, Chang'e-3 is scheduled to land in the Sinus Iridum region of the moon and the rover will start to explore the moon's surface, sending 3D images back to Earth. This is China's first attempt at landing a spacecraft beyond the Earth's surface and man's first lunar landing since 1972. Hong Xiaoyu is SHAO director, and commander in chief of the Chang'e-3 VLBI Orbital Measuring Subsystem, a key part of the project. 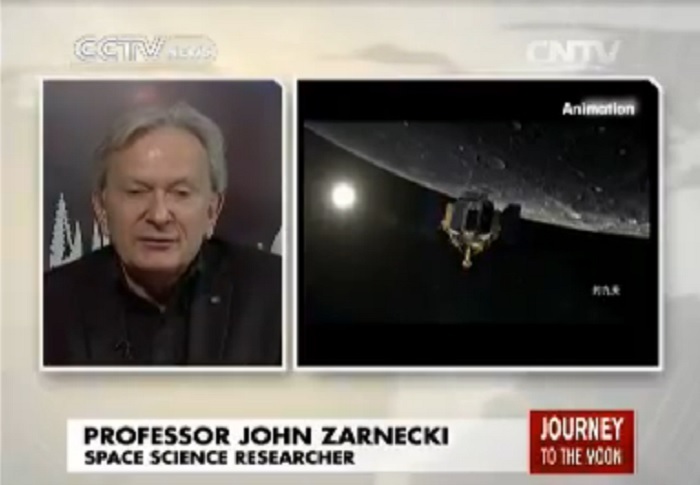 He told the Global Times, "the VLBI technique plays an important part in the Chang'e-3 mission. Without VLBI a soft landing would be impossible." In 2004 China officially established its lunar exploration program which involves spacecraft orbiting, landing and returning to Earth. 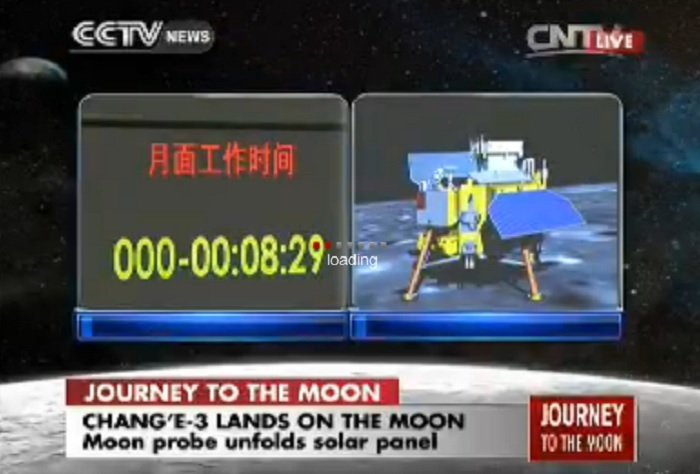 Following the success of Chang'e-1 and Chang'e-2 missions in 2007 and 2010, the Chang'e-3 is now beginning the second phase of the program, the landing. VLBI has been a part of the Chang'e program since Chang'e-1 and has kept developing. VLBI originated from radio astronomy - by employing radio interferometry, multiple radio telescopes can produce the effect of single huge conventional telescope. Hong said, the further the distance between two radio telescopes the definition is accordingly higher. On Earth the VLBI network and subsequently the definition is limited because of the size of the Earth but scientists have been expanding this by sending radio telescopes into space. Hong said the Chinese VLBI network currently comprises observation stations at Beijing, Shanghai, Kunming, Urumqi and the SHAO VLBI center. 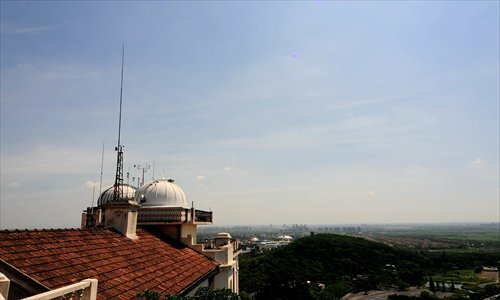 The new VLBI center in the Sheshan Science and Technology Park just came into service this year. It is also the first time Shanghai's newly completed 65-meter radio telescope, the Tianma, regarded as the most precise radio telescope in Asia and the fourth in the world, has been involved in the Chang'e missions. "The resolution achieved by this VLBI network is equivalent to a super-telescope with an aperture of more that 3,000 kilometers," Hong said. The average distance between the Earth and the moon is 380,000 kilometers and it took the Chang'e-3 112 hours to complete its Earth-to-moon journey before it moved into a 100-kilometer lunar circular orbit on December 6, and then on December 10 going into an elliptical orbit which placed it at its nearest point just 15 kilometers from the moon's surface. On Saturday it will make its soft landing. 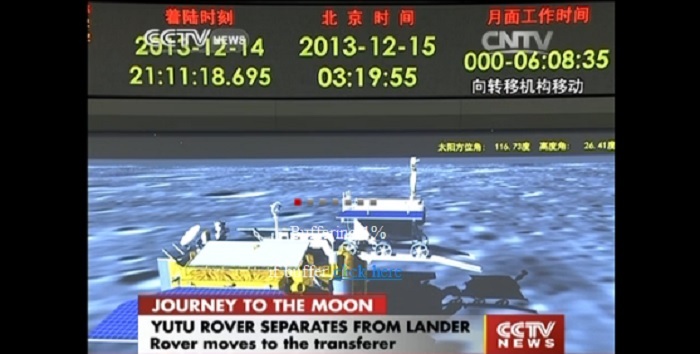 On its journey while Chang'e was within 20,000 kilometers of Earth it was being followed by ocean survey vessels and land tracking stations. When it passed that mark it was tracked by the VLBI subsystem. Wang Guangli, the deputy chief designer of Chang'e-3 VLBI Orbital Measuring Subsystem explained, "The antennas of radio telescopes are very lengthy so they turn very slowly. They do not do well with close quarters tracking but long distance measurement is their specialty." Zheng Weimin, the chief designer of the Chang'e VLBI subsystem, explained: "The four key components of the VLBI subsystem are real-time VLBI data processing which demands rapid measurements, Delta-DOR measurements which need precision measurement, lunar surface target positioning which needs accuracy to guide the lunar lander, and same beam high-precision positioning technique which sets the relative positions of the lander and the rover." Zheng told the Global Times, the VLBI subsystem was mostly responsible for the exact positioning of the lunar probe and rover. The team was working on a 1 kilometer accuracy range - not so easy when the team is 380,000 kilometers away. But with current testing Zheng said the actual accuracy Saturday get may well below the 1 kilometer criteria. 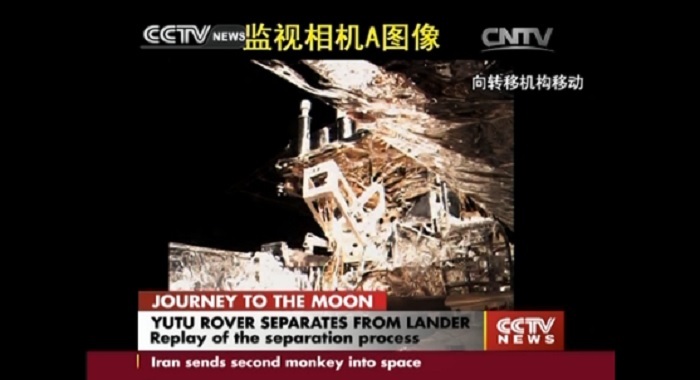 After Chang'e-3 makes its soft landing, the rover will separate from the probe and the two units will photograph each other. 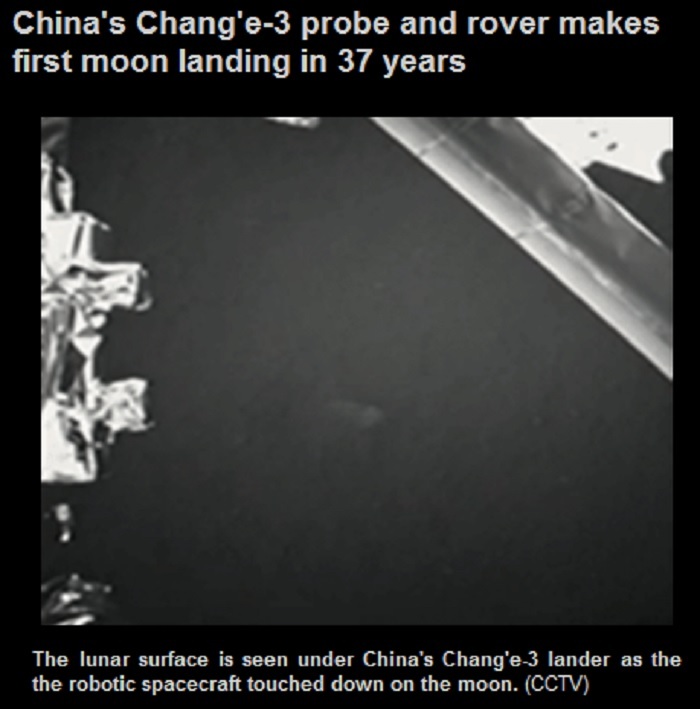 "A safe soft landing of the probe and the completion of these photographs will mean the Chang'e-3 mission will have succeeded. Later the rover will carry out scientific exploration work and the VLBI subsystem will keep tracking it," Zheng said. VLBI is generally used internationally to measure astronomical bodies. But in adapting it for deep space exploration Chinese scientists had to overcome several hurdles including modifying the basic formula to fit the shorter distances. Zheng explained that in astronomy the time frame did not have to be so precise - one week or one month made no difference in measuring stars, quasars or other heavenly bodies. However real-time data reception, processing and transmission are some of the most important requirements for space exploration. The time gap for the Shanghai VLBI center to provide the data it receives to the Beijing center has been slashed from 10 minutes for Chang'e-2 to under 1 minute now. "Astronomy can tolerate mistakes but space exploration cannot," Zheng said. "Everyone on the team wants the mission to succeed." 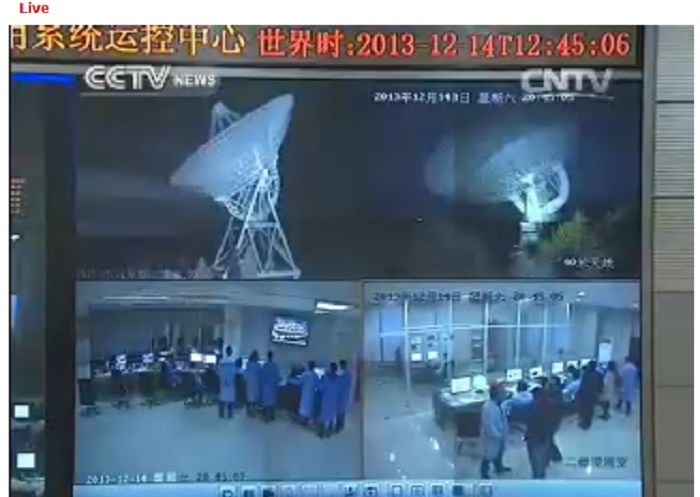 For the Chang'e-3 mission, there are scores of people working in the observation stations. About 60 technicians work round the clock at the Shanghai VLBI center and almost a third are graduate students. The technicians at the center work in 16 sectors each with different responsibilities. No.1 sector handles task scheduling, No.4 is responsible for data acquisition, No.6 deals with data transmission. Other sectors handle orbit determination, position and operation management. Each module is set by dual posts of A and B, prepared for all contingencies. Guo Li is a SHAO technician and she has worked as a team member since Chang'e-1 when she was still a graduate student. She works in the position determination sector which provides a precise location of the lander and rover at all times. She said three or four people work in each sector. "At key moments like the launch, braking and the soft landing, the members work together, otherwise, we work in shifts." From December 1 to late December, Guo and her colleagues are living at SHAO in the Sheshan Science and Technology Park. They arrive for work at the center at 9 am every day and return to their dormitories at 10 pm. 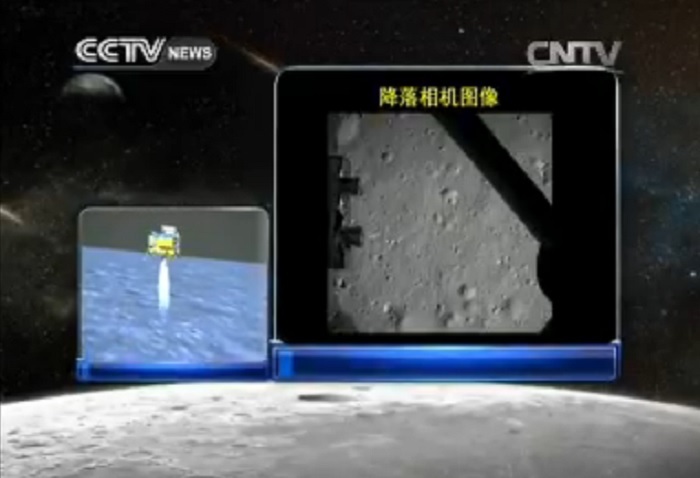 "I was very excited when I took part in the Chang'e-1 mission but now I am more relaxed. If the mission runs smoothly, I will be really happy," Guo said. Zhang Jinwei, a graduate student who studies astrogeodesy and astromechanics and works for the position determination sector told the Global Times, that the most important thing he has learned is that everyone involved in the Chang'e-3 VLBI subsystem took responsibility. "If there is just a tiny problem in any of the sectors everyone will try to help." Bi Huichun, another graduate student who studies electronics and communications engineering and works for the operation management sector said, "As a fresher involved in this mission for the very first time, I know I am just a small cog in the team but I will treasure this experience for a long time." Pan Hongjian is the deputy administration manager at the subsystem center and said staff had practiced for the big event with a series of drills in November. The kitchens have even provided specially designed meals, Lunar Exploration Dinners, for the staff who have to work long hours in air conditioned rooms. It is not just the kitchens that are helping the mission. Many support staff and departments help keep the subsystem center on track - like the teams ensuring that power remains unaffected no matter what. "The State Grid Shanghai Songjiang Power Supply Company set up seven teams to carry out the work and maintenance," Pan said. He said that several years ago, before the new Sheshan Science and Technology Park had opened, the technical support team worked from old building in Xujiahui but a power cut seriously interfered with their work during one mission. 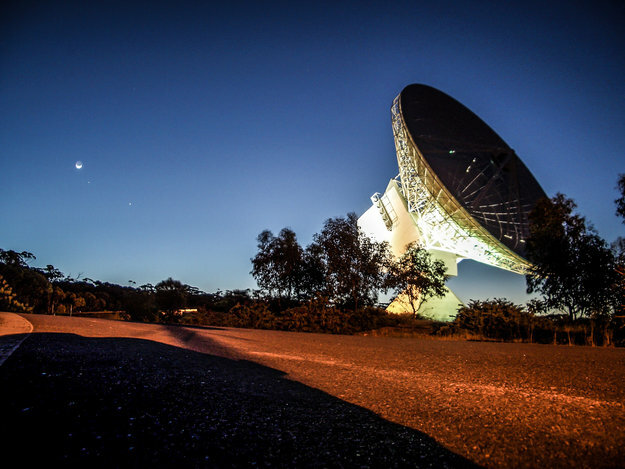 ESA's New Norcia station, DSA-1 (Deep Space Antenna-1), hosts a 35 m-diameter parabolic antenna and is located 140 km north of Perth, Western Australia, close to the town of New Norcia. DSA-1 communicates with deep-space missions, typically at ranges in excess of 2 million km. It is also capable of supporting the ultra-precise 'delta-DOR' navigation technique. On 14 December 2013, New Norcia station will support the powered descent of China's Chang'e-3 Moon mission; the station will measure the Doppler shift of signals from the spacecraft. Recording this will help Chinese engineers to reconstruct the trajectory for future reference. China is set to land a robotic rover on the surface of the Moon, a major step in the Asian superpower's ambitious programme of space exploration. On Saturday afternoon (GMT), a landing module will undergo a powered descent, using thrusters to perform the first soft landing on the Moon in 37 years. The touchdown will take place on a flat plain called the Bay of Rainbows. The Chang'e-3 mission launched on a Chinese-developed Long March 3B rocket on 1 December from Xichang in the country's south. "On the evening of December 14, Chang'e-3 will carry out a soft landing on the lunar surface," said a post on the mission's official blog on Sina Weibo, the Chinese version of Twitter. The task was described as the mission's "most difficult" in the post, written by the Chinese Academy of Sciences on behalf of the space authorities. It is the third robotic rover mission to land on the lunar surface, but the Chinese vehicle carries a more sophisticated payload, including ground-penetrating radar which will gather measurements of the lunar soil and crust. According to translated documents, the landing module will begin actively reducing its speed at about 15km from the Moon's surface. When it reaches a distance of 100m from the surface, the craft will fire thrusters to slow its descent. 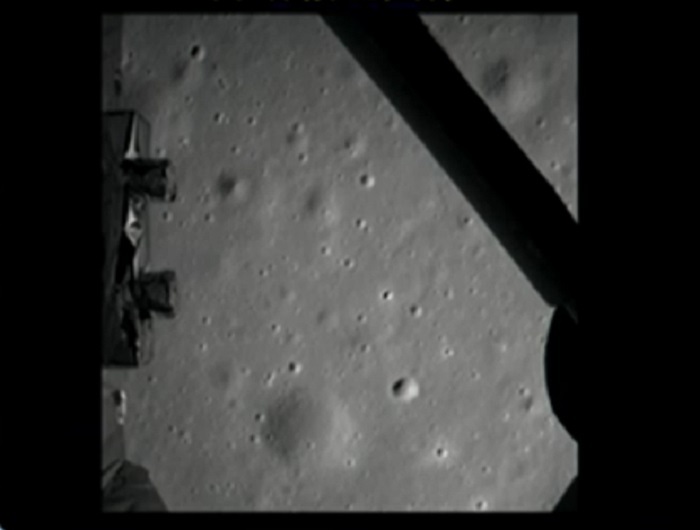 At a distance of 4m, the lander switches off the thrusters and free-falls to the lunar surface. The Jade Rabbit is expected to be deployed on Saturday evening, driving down a ramp lowered by the Chang'e-3 landing module. According to Chinese space scientists, the mission is designed to test new technologies, gather scientific data and build intellectual expertise. Space exploration was, he told BBC News, "a reflection of your economic power, because you need spare resources to have a space programme. It clearly has military implications because so much space technology is dual use". He added: "It reflects your scientific and technological capabilities, it supports your diplomacy by making you appear strong. "China is saying: 'We are doing something that only two other countries have done before - the US and the Soviet Union." Mr Cheng explained that the mission would provide an opportunity to test China's deep-space tracking and communications capability. "The rover will reportedly be under Earth control at various points of its manoeuvres on the lunar surface," Mr Cheng wrote in a blog post. "Such a space observation and tracking system has implications not only for space exploration but for national security, as it can be used to maintain space surveillance, keeping watch over Chinese and other nations' space assets." The European Space Agency said it would provide communications support on the mission. Erik Sorenson, head of ground facilities at the European Space Operations Centre in Darmstadt, Germany, said Esa's tracking facilities would be able to reconstruct the craft's trajectory during descent and determine its precise location on the Moon. The lander's target is Sinus Iridum (Latin for Bay of Rainbows) a flat volcanic plain thought to be relatively clear of large rocks. It is part of a larger feature known as Mare Imbrium that forms the right eye of the "Man in the Moon". 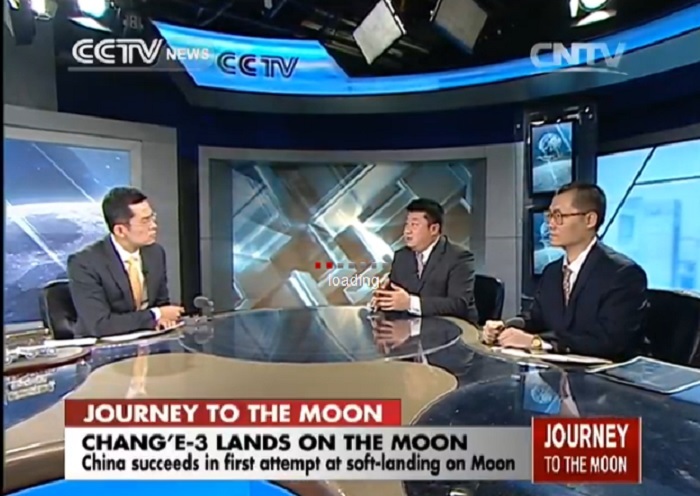 "[Chang'e-3] is probably laying some of the groundwork for a manned mission," said Mr Cheng. China landed an unmanned spacecraft on the moon on Saturday, state media reported, in the first such "soft-landing" since 1976, joining the United States and the former Soviet Union in managing to accomplish such a feat. 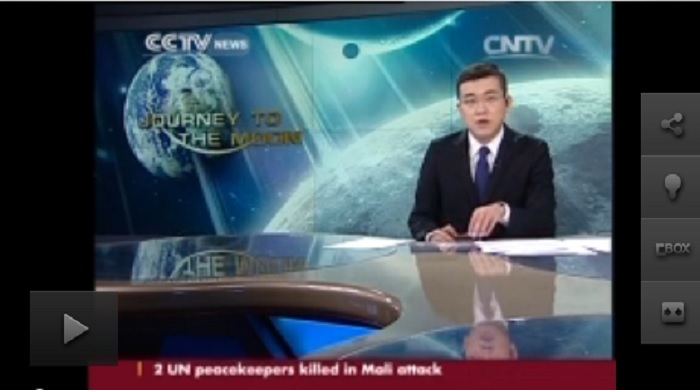 The first photo of the moon by China's Chang'e 3 lunar lander is shown here in this still from a broadcast by the country's state-run CNTV news channel on Dec. 14, 2013. 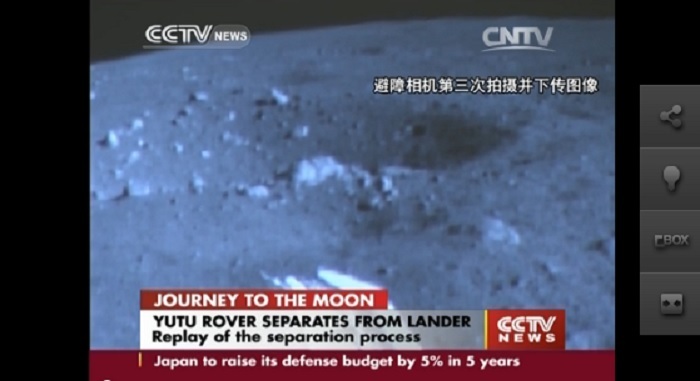 Chang'e 3 delivered the Yutu rover to the moon with its successful landing. 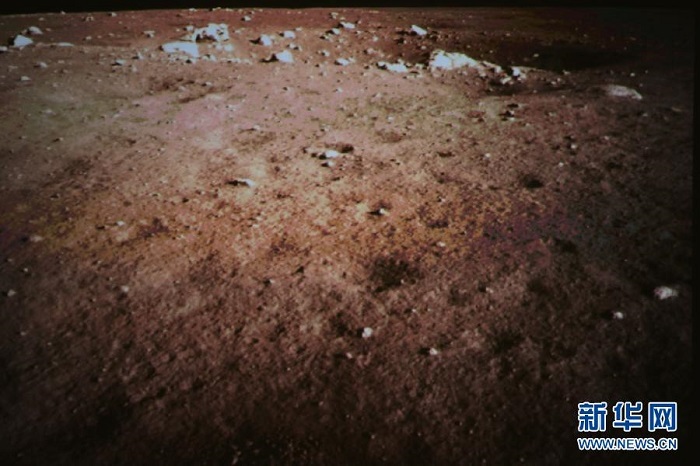 The surface of the moon, in a photograph taken by the camera of the lunar probe, Chang'e-3, displayed on the screen of the Beijing Aerospace Control Center in China. 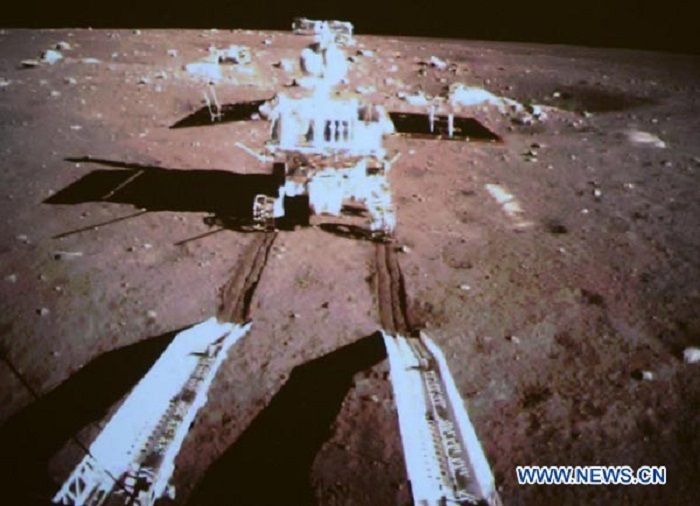 China's Chang'e-3, which includes its first lunar rover named Yutu, or Jade Rabbit, has successfully soft landed on the Moon Saturday, fulfilling the long-awaited dream of moon landing of the Chinese nation. 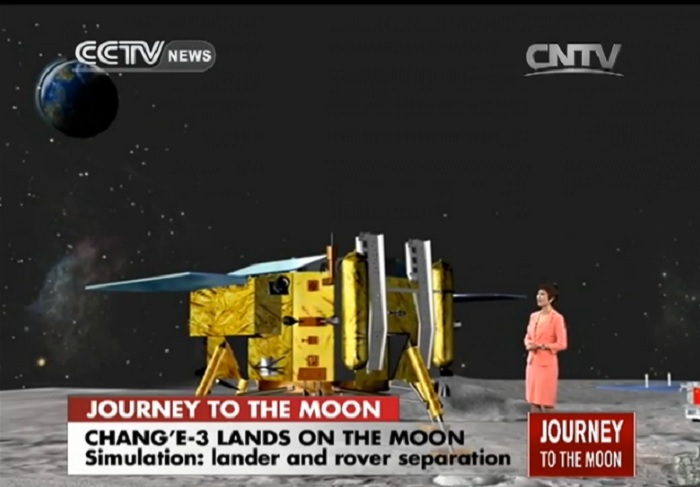 Since the successful launching of Chang'e-3 mission early December, the Chang'e-3 lunar exploration program has been put in the spotlight. Now as Jade Rabbit has made its touchdown on the moon surface, the whole world again marvels at China's remarkable space capabilities and even extends their aspiration for space cooperation with China. "It (Developing space programs) is also a way to mobilize resources and to concentrate resources in a way that could result in certain types of spinoff technologies," said Mark Stokes, the executive director of the Project 2049 Institute, a research organization in Washington focused on security issues in Asia. 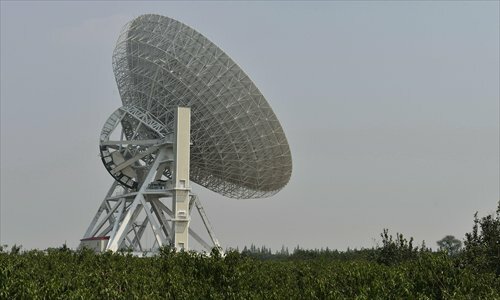 Above all, China has been learning how to orchestrate complicated engineering tasks, said Dean Cheng, a senior research fellow at the Heritage Foundation in Washington who has studied China's space programs. "We in the U.S., in the West, tend to focus on the widget aspect of China's space progress," Cheng said. "But I would say what we sometimes miss is the Chinese space efforts aimed at improving their systems engineering." As well as patriotic pride, China's space activities are generating skills to enhance the country's science, satellites and military, the New York Times quoted experts as saying. "China's advances in space include five manned flights, which are intended to pave the way for a space station." "The Chang'e-3 details tell me that the U.S. now absolutely must start communicating with the Chinese about lunar cooperation," said U.S. astronaut Buzz Aldrin of Apollo 11, in an interview with the magazine Aerospace America. "The U.S. knows more about the Moon than anyone else, and we know more about bringing together foreign partners, as we did for the International Space Station," he added. 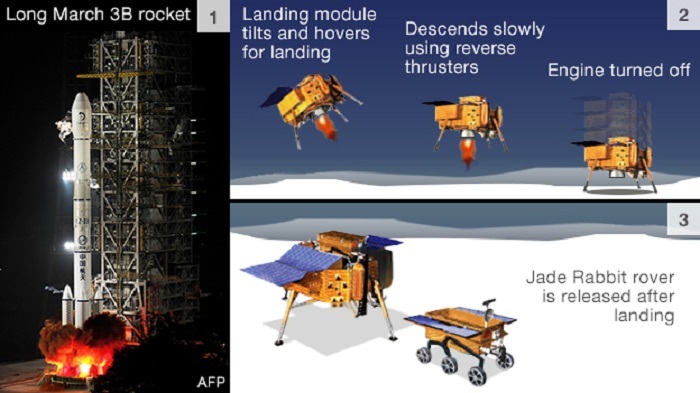 The lander spacecraft is more than 40 percent the size of a NASA Apollo lunar module at descent stage, and the Chinese are building them on an assembly line basis, the magazine reported. "The Chinese will be the next on the Moon, and they are going to be there for a long time, with significant staying power," said Eugene Cernan, a U.S. astronaut of Apollo 17. He and Aldrin believed Chinese manned lunar landings will be possible on larger versions of the Chang'e-3 design within 10 years. Germany's Frankfurter Zeitung on Dec. 2 acclaimed the Chang'e-3 lunar probe as "the first successful attempt of an Asian power in the history of space travel." "So far there have been only two countries that made it to the Moon: the United States and the Soviet Union." "China has made rapid progress in space travel. It develops much faster than the previous world powers in space exploration projects as well as many other fields. Ten years ago, China sent its first astronaut into space, but now it is already on the way to building a space station," it added. Cornelia von Ammon, Germany's spokesperson of the federation of aerospace industry, said the German federation pays close attention to the Chinese lunar mission. The success provides further insights into lunar exploration and impetus for further research approaches. "An air show is scheduled to take place in Berlin in May 2014 and we are looking forward to China's participation in the show with great interest." Igor Lisov, an expert at Russia's Novosti Kosmonavtiki Monthly, pointed out the previous Soviet Moon program was successful as a whole but at tremendous costs. The Soviet Union launched 24 missions to the Moon, but the first five all turned out to be failures; its space efforts only started to pay off from its sixth attempt, which was the landing of the lunar rover Lonokhod. "Besides, in the 1970s the crew were well trained to operate the Lunoklod on the Moon surface remotely from the Earth, whereas China's Yutu is equipped with a GPS system that allows much improved orbit insertion accuracy and prevents it from colliding with other objects. 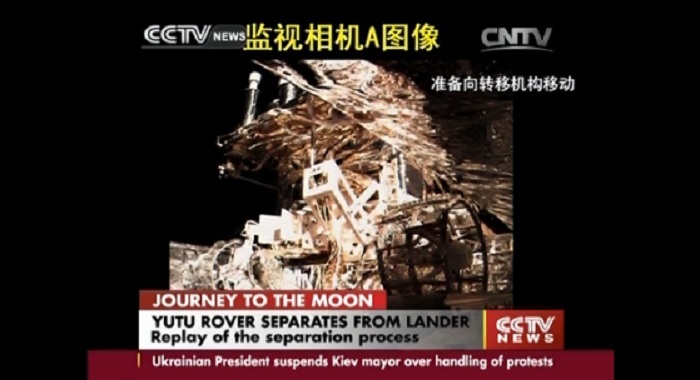 That is the biggest difference between Yutu and Lunoklod." Russian astronaut Vladimir Kovalenok said, "It is a landmark flight." The Chinese lunar program is advancing on the right track, and China can and will go down this right path on its own while taking into pros and cons of lunar programs in the United States and the Soviet Union, he said. "China is now a pioneer in this field, and its lunar missions will be a catalyst for lunar explorations in other countries as the Moon can serve as a basis for a 'jump' on journeys to more distant space in the universe," he added. Japan's Yomiuri Shimbun said lunar probe is of great importance to other space exploration programs including the exploration of Mars. With the Chang'e-3 mission smoothly completed, China will be able to make more voices heard in the future Moon exploration and development. Segawa Shiro, a professor at the faculty of political science and economics of Waseda University in Japan, told Xinhua that science and technologies have made huge progress since moon landing in the 20th century, and therefore Chang'e and Yutu will undoubtedly adopt cutting-edge automatic sensors technology. To soft land on the Moon using latest technologies can help people appreciate the wisdom of science and give people inspiration. He also believes it is particularly significant because the mission provides an opportunity to share mankind's knowledge about space inspection and exploration. Japan's lunar probe is also under way and international space cooperation is much needed. Finland's largest news daily Helsingin Sanomat said the conquest of space is a source of pride for China and its ordinary citizens. "The Moon is a suitable target for China to carry out space exploration, because it is close to us and technologies developed for the Moon landing can also be later applied to further exploration, such as the conquest of Mars." 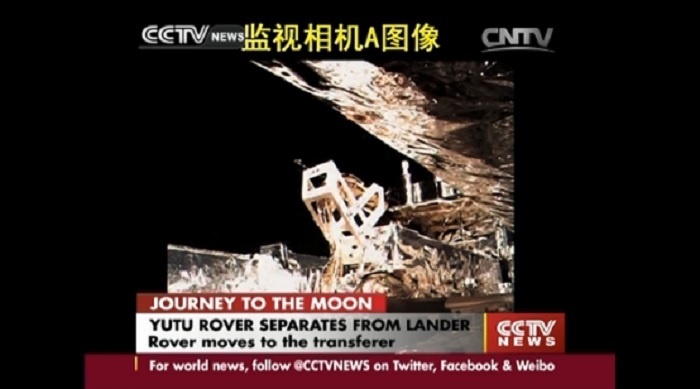 China's first moon rover, Yutu, or Jade Rabbit, separated from the lander early on Sunday, several hours after the Chang'e-3 probe soft-landed on the lunar surface. 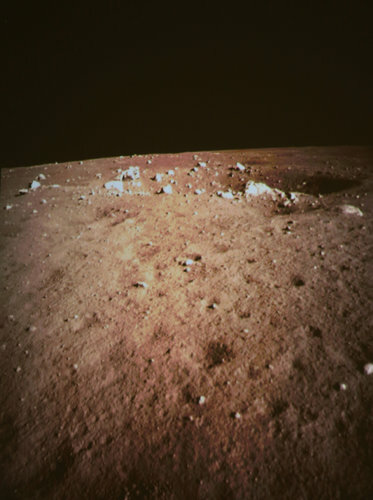 Engineers made final checks of the environment of the landing site, the situation of the probe and the solar incidence angle late night on Saturday and sent signals of separation to Chang'e-3. The transfer mechanism unlocked at 4:06 with one side reaching the moon's surface, allowing the rover to descend to the surface following a ladder mechanism. Chang'e-3 landed on the moon's Sinus Iridum, or the Bay of Rainbows, at 9:11 p.m. Saturday, making China the third country in the world to carry out such a rover mission after the United States and former Soviet Union. In ancient Chinese mythology, Yutu was the white pet rabbit of the lunar goddess Chang'e. The name for the rover was selected following an online poll that collected several million votes from people around the world. 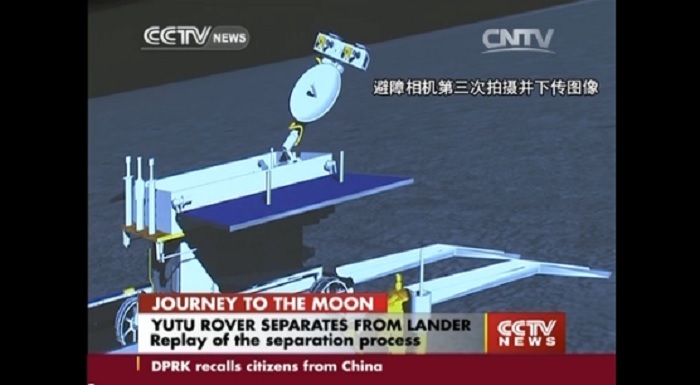 Yutu will survey the moon's geological structure and surface substances and look for natural resources for three months, while the lander will conduct in-situ exploration at the landing site for one year. A customer pays for a mobile phone card at a streetcorner store which also sells local newspapers with front page images of China's Chang'e-3 spacecraft landing on the moon, in Beijing, China, 15 December 2013. The first-ever Chinese spacecraft, the Chang'e-3, landed on the moon on 14 December, while reports stated that the craft's moon rover named 'Yutu', or Jade Rabbit, rolled out onto the surface of the moon on 15 December. 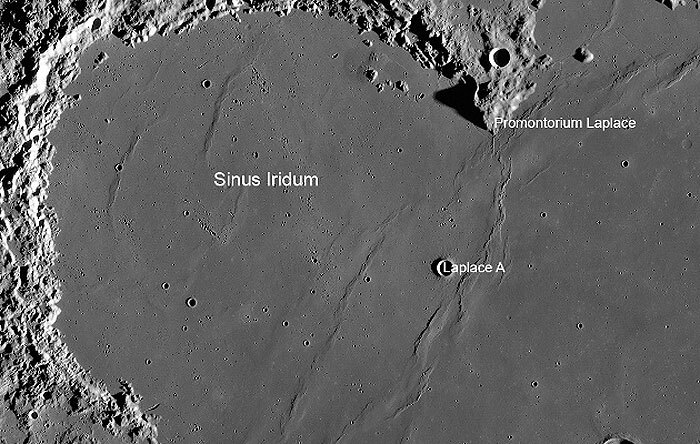 The Sinus Iridum, aka Bay of Rainbows. Photo via NASA. 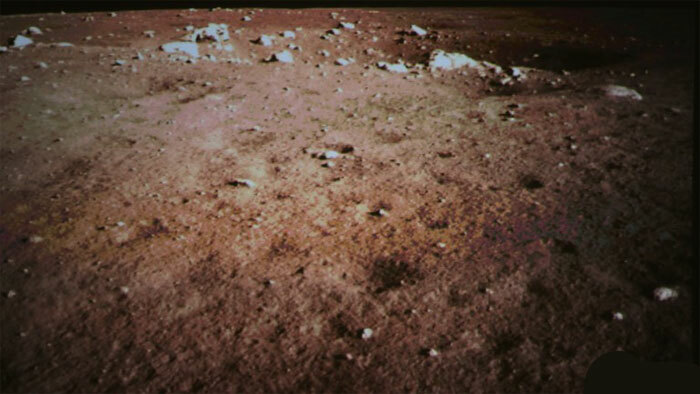 Chinese flag appears on lunar surface for the first time. China's first lunar rover and the lander took pictures of each other near mid-night on Sunday, marking the complete success of the country's Chang'e-3 lunar probe mission. President Xi Jinping and Premier Li Keqiang, who both came to the Beijing Aerospace Control Center late Sunday night to watch the photo-taking session, congratulated scientists for the success. 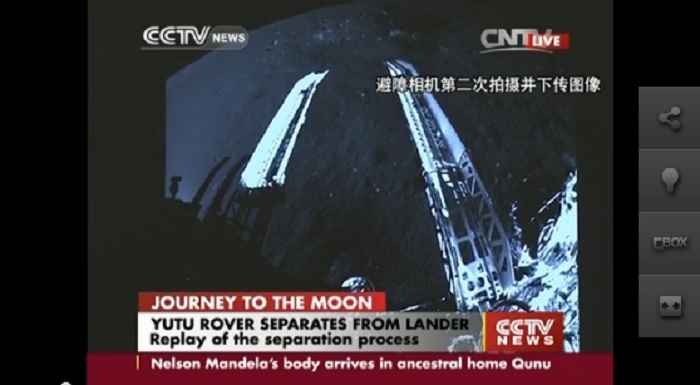 Ma Xingrui, chief commander of China's lunar program, announced lunar probe Chang'e-3 mission a "complete success", after the lander and moon rover took pictures of each other. A national flag was shown pasted on the moon rover in a picture taken by the lander. Aerospace experts said the flag, plus another one on the lander, could sustain extreme weather conditions. It was the first time China's national flag had appeared on a celestial body. Yutu , which has a designed life span of three months, will also conduct geographic surveys, said Sun Huixian, deputy chief engineer of China's lunar exploration program. In ancient Chinese mythology, Yutu is the white pet rabbit of the lunar goddess Chang'e. The rover will analyze major elements on the lunar surface and study energy and mineral resources along its route. A radar system attached to the bottom of the rover can probe up to 100 meters beneath the lunar surface, he said. 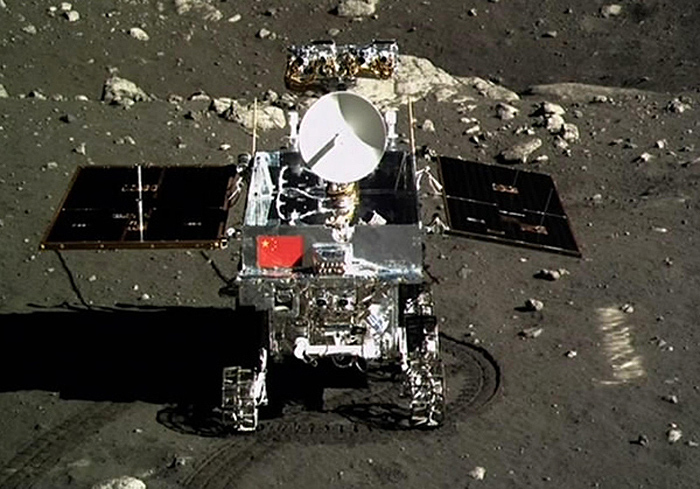 Sun Zezhou, chief designer of the Chang'e-3 probe, said Yutu is able to climb slopes of up to 30 degrees and travel at 200 meters per hour, explaining that designers set a low speed for the vehicle because it has to detect and avoid obstacles. Theoretically, Yutu can travel nearly 10 kilometers on the moon, Sun said, noting that engineers had set up a laboratory on Earth to simulate the rigorous environment on the moon and the rover has passed numerous tests. Using its ability to detect obstacles, the rover will determine a path of least resistance by coupling onboard navigation systems with remote control. The moon's wide temperature range — from more than 100 C during day to as low as -180 C at night — presents another challenge to the rover. To work properly, the rover has to maintain an internal operating temperature range of -40 to 50 C, so both the lander and rover are equipped with radioisotope heater units. The Chang'e-3's lander will deploy a telescope to observe stars, the galaxy and the universe from the moon, according to Sun. "This is the first time humankind has placed a telescope on the moon. The special environment on the moon will enable us to conduct observation that could not be done on Earth due to the impact of the atmosphere," he said. In addition, the lander also carried an extreme-ultraviolet imager to observe the plasmasphere over Earth. The 140-kilogram, six-wheeled rover touched the lunar surface at 4:35 am on Sunday, leaving deep tracks on the loose lunar soil. A camera on the lander recorded the process and the images were sent to Earth, according to the Beijing Aerospace Control Center. The Chang'e-3 probe landed on the moon on Saturday night, making China the first nation to do so in nearly four decades. The last soft landing took place on Aug 18, 1976, with Luna-24, a spacecraft of the former Soviet Union. Researchers from the United States and other nations viewed Chang'e-3's operations on the moon as "a new scientific opportunity that could potentially enhance studies and observations of the lunar atmosphere", NASA said on Friday. "The Chang'e-3 details tell me that the US now absolutely must start communicating with the Chinese about lunar cooperation," said US astronaut Buzz Aldrin of Apollo 11 in an interview with Aerospace America magazine. Russian astronaut Vladimir Kovalenok said the Chinese lunar program is on the right track and China can go down this path while taking into account the pros and cons of lunar programs in the United States and the former Soviet Union. "China is now a pioneer in this field, and its lunar missions will be a catalyst for lunar explorations in other countries, as the moon can serve as a basis for a ‘jump' on journeys to more distant space in the universe," he said. China is likely to realize the third step of its lunar program in 2017, which is to land a lunar probe on moon, release a moon rover and return the probe to Earth.